Smart Home Technology is cutting edge. Home Automation, often referred to as “Smart Home Technology”, is the use of technology to automate your home. Home automation allows you to control almost every aspect of your home through the Internet of Things (IoT). Home Automation started with the invention of the Thermostat and has developed into one of the biggest and fastest growing markets in technology. Home Automation’s potential continues to grow. You can use it for home security, controlling appliances, monitoring energy use, as a personal assistant, for looking after the elderly or disabled and more. In this guide, you will learn everything you will need to know about Home Automation. Not just how it works, but the different ways it can be used, and its downfalls. You will also find several helpful links to emerging Smart-Home products, just in case you run across a piece of technology you never knew you were missing. It is hard to explain how Home-Automation works because there isn’t one universally accepted protocol. The technology varies from country, company, and type of automation. Often, because the Home-Automation market is so lucrative and fast-paced, companies will withhold new developments. The first industry standard for home Automation was X10. X10 helps devices connect to each other primarily through power line wiring, radio frequency, and wireless-based protocols. Today Zigbee, Z-Wave, and Insteon are also leading protocols for Home Automation. These new industry standards rely more heavily on modern wireless technology, like mesh-networking. All of these systems are very complicated. Simply put, they use electricity, radio waves and wireless technology to send messages to and from devices. A Smart Home control panel. Central Control: Central Control is one Home-Automation system that controls everything in your home. It allows you, from a single source, to control your lights, thermostat, sprinklers, phone, washer, dryer and more. This type of Home-Automation is most popular with businesses and upscale private residences. It is also very popular with Home-Automation security systems. Usually, Central Control systems are run through a wall mounted terminal, like the kind commonly used for home-security systems. They also can be accessed by a remote control device, smartphone, tablet or computer. Pros: The number one benefit of a central control system is in its name. You can access all the different aspects of your home from one convent system. Everything from your shower to you home-security network can all be controlled via one central system. Central control systems are also fairly high end, which in turn means high quality. Cons: These systems tend to be more expensive and require professional installation. As Home Automation grows, more and more people are moving toward app-based automation that can be paired with Smart Hubs to mimic Central Control systems. Another issue with these systems is that they are very inclusive. If you choose to go with a central system, you are often limited to the devices that pair with that system. For example, if you wanted to go out and buy a new washing machine, you would be limited to the machines that work with that system. As time goes on, many systems are adapting to the home automation market by making themselves more compatible with emerging technologies. App-based home automation can be controlled from your smartphone. App Based: App-based Smart-Home technology uses your home network to communicate with the Cloud. Cloud technology is a vital part of the Internet of Things, and both have grown very popular in the last few years. Most app based smart devices work by connecting your Home-Automation devices to your home network via Wi-Fi. Those devices connect to a severer somewhere, which you then access through apps on your smart device. Once you have created a personalized account with these apps you can coordinate with your Smart Home devices. This way the company knows which device goes with which app user. As long you and your smart home devices are connected to the Internet, you can communicate back and forth with most of these cloud-based Home-Automation devices from anywhere. 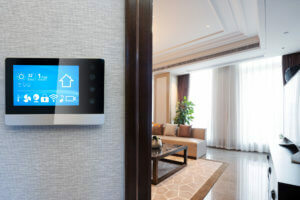 Some app-based home automation technology connects to your smart device directly through Bluetooth. Like cloud-based home-automation, you still need to create a personal account on the app. Unlike cloud-based apps though, you need to be in the vicinity of these home-automation devices for them to work. Pros: App-based Home Automation is certainly responsible for the accessibility of Smart-Homes for the general population. So many are creating DIY Smart homes because these devices are affordable, easy to set up, use, and update. There are also so many different options, and because it is such a huge market right now, new devices are constantly coming out. Cons: Unlike Central Control, most Smart-Homes running off cloud-based Home Animation require several different apps. Some Smart-Home tech distributors offer several different devices that you can access through their one app. On the other hand, developers are already creating devices that mimic the Central Control systems. Technology has been growing at insane speed, and it isn’t slowing down. Things we once only saw in science fiction are now a reality. You can call people from your watch like James Bond, talk to your computer like Hal 9000 (though hopefully not just like Hal) and now you can have a smart home like Iron Man. Smart home technology has actually been around for a few years. Bill Gates started building his smart home in 1988 and finished in 2005. Today, you don’t have to be a billionaire to own a smart home, and it certainly won’t take 17 years to construct. 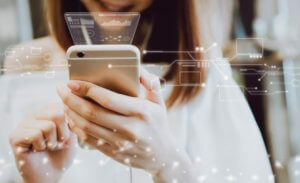 Whether you want to run your home through a central system, or are happy with app-based devices your options are very broad, and just keep widening. Watch whatever you want with your Smart TV. Let’s start with the basics. The following are the most commonly used Smart Home options on the market right now. They are easy to use, install, and tend to be the most affordable Smart Home tech. 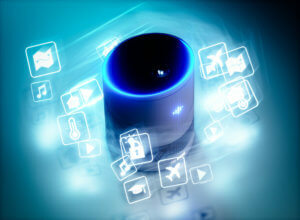 Smart Speakers: It is reported that 39 Million Americans have a smart speaker in their home. It is no surprise, considering all the things they are capable of. Smart speakers can do so much more than play music, though they do an excellent job of that. They can search the internet, tell you the weather, give you a news debriefing, work as a personal assistant, and can act as a central control hub for your entire Smart-Home system.With the right smart speakers, you can control almost every aspect of your home with just your voice. Ask Alexa who is at the front door, use Siri to turn off the light you left on upstairs, and turn the heat down with Google. If you are looking to use your smart speaker as a Home-Automation hub, you need to double check that the devices you buy are compatible with your speaker as not all are. Smart TVs: Smart TVs are great because you can watch basically anything you want, whenever you want, whether you have cable or not. 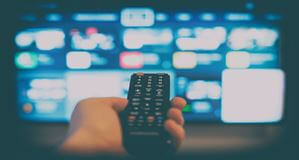 A smart TV usually refers to the TV itself, but in this case, it is an umbrella statement for all IoT video streaming devices. There are tons of options these days when it comes to streaming TV. You can get a literal smart TV, that streams Netflix, Hulu, Amazon etc. straight from the unit itself, or you can get a system to pair with your normal TV. Many of these devices can be paired with your Smart Speakers and Central-Control hub, making your home even smarter. Smart Thermostats: With smart thermostats, you can monitor your HVAC from wherever you are. You can also set them on a schedule so that energy isn’t wasted when no one is home. Some smart thermostats have a sensor option that automatically changes the temperature when they sense it is needed. Smart Plugs: Smart plugs can convert an object into a smarter version of itself. Just plug them into your normal outlets, and then whatever is being powered by them can easily be turned on and off from your smart device. Light Automation: When it comes to light automation there are two options. The first is installing smart light switches. Smart light switches not only can be controlled by an app, but many give you a variety of lighting choices, like dimming. The second smart lighting option is smart bulbs. Like smart plugs, smart bulbs enhance regular lights into smart ones. Switch out your old bulbs for smart ones, and you will be able to automate your lighting. So which is a better choice? Smart switches are the more affordable option but often involve complicated installations. Smart bulbs offer more lighting options, like dimming or soft light, but are more expensive because they require the purchase of a translator hub to work with your smart devices. Video Door Bells: Video doorbells not only sense, and alert you when someone is at the front door, but can also show you video footage of who is there, and can use intercom technology to talk to your visitor. No longer do you have to yell “who’s there?” or “come in” from across the house. You can see from your smart device, or even ask your smart speaker to show you. Robot Vacuums: Accessibility to a robot maid may be pretty far off, but a robot vacuum is the next best thing. They can be controlled from your smart devices, including your smart speakers. As if having a robot vacuum wasn’t enough, some of these vacuums come with their own artificial intelligence (AI) like your smart speakers, and a few can even stream pictures and video straight to your smart device. 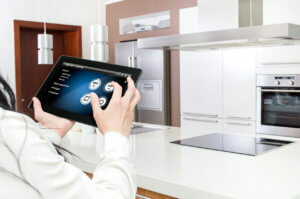 You can interact with your kitchen with your smart devices. Though technology has yet to provide us with a robot chef, these smart kitchen appliances make cooking and cleaning that much easier. You can even connect many of them with your smart speakers! Smart Refrigerators: Smart refrigerators vary in capability. They can tell you how often they are being accessed, alert you if a door is left open, let you know what products you need to buy, and a few models even have monitors that can stream TV. Smart Refrigerators can come with one of these features, a combination of them, or all of them. Some fridges display this information straight from the unit, but others send all the information to an app. Most of the app compatible refrigerators will also run diagnostics, to make sure everything is running smoothly. It really depends on what you are looking for. Smart Ovens: Smart Ovens allow you to control your over from anywhere. There even smart ovens that can be controlled through Alexa. Some apps also allow you to look up recipes and queue up the time and temperature needed for them, but often you still need to press start. Most smart ovens will at least let you control the timer, and run diagnostics for you. Smart Dishwashers: Smart dishwashers run on very similar apps as smart ovens and app compatible smart fridges. This is because they are produced by the same companies (e.g. LG, GE, Whirlpool etc.). With these apps, you can check the status of your wash, get notifications when your load is done, and stop/start a load. Similar to the oven, and refrigerator, most of these apps also will run diagnostics on your units if necessary. Smart Laundry: Laundry isn’t necessarily a kitchen chore, but because these apps are the same as the previous appliances, it fits. Theses smart washers and dryers are just like the dishwasher. You can start/stop/pause a load, check on the status, receive a notification when the load is finished, and run diagnostics from the convenience of your smart device. Smart Dishes: You can buy smart plates, and forks that monitor your calorie intake, and connect with an app to help you keep track of what you are eating. You probably shouldn’t put them through your smart dishwasher though. Smart Slow Cookers: Control you smart crockpot from your phone or tablet. You can check the temperature, change the setting, and turn it on and off. It makes the easiest cooking device even more convenient. Smart Coffee Pot: Most coffee pots can be set on a timer to start brewing when you want. Smart pots can be told to brew from your phone so that whenever you want coffee you can start a pot. Smart Trash Cans: Most smart trash cans are just touch-free, and odor controlling. There is one smart can that incorporates a barcode scanner. As you throw your food away, you scan the barcode, and the trash can adds it to a grocery list on your smart device. Dash Buttons: Amazon dash buttons allow you to create a button for any household product that you can order from Amazon. The buttons can be placed anywhere, so in theory, you could place your Tide Pod button in your laundry room, so as soon as you that you are running low you simply press the button and reorder them. Many companies are looking to develop similar smart buttons. Even the most basic necessities can be enhanced in a Smart Home. Smart-Bathroom technology will make your bathroom more than a room you have to use. Smart Toilets: Smart toilets offer basic features, like touch-free flushing, a sensor that opens/closes the lid, automatic bowl cleaning, and deodorizer. They also have some more extravagant features as well, like a built-in bidet, heated seats and more. Enhanced Vanities: Imagine brushing your teeth and watching TV in the mirror. With enhanced vanities, you can do just that. You can even have smart mirrors with touch activated lighting and fogless surfaces. Mirrors are not the only part of enhanced vanities though. You can alsoinvest in a towel heating drawer, for a spa-like experience every day. Smart Showers: Smart showers have various capabilities. They can be turned on from the comfort of your bed before you even wake up, they save your perfect shower setting, and some even have a TV in them. Privacy Windows: Smart privacy windows can be installed, or can be as easy as a film you place over your windows. They can change from a normal window to an opaque window no one can see through, from a remote or from your smart device. Many privacy windows also protect from harmful UV rays and work as insulators to maintain a comfortable temperature. Having a newborn is one of the most rewarding, and stressful experience in life. Thanks to Smart-Nurseries, babies are safer than ever, and parents can relax just a little. Video Monitors: Baby monitors have changed completely now that video cameras can easily be incorporated. Now, instead of merely listening in on your infant, you can visually check up on them from any room. Most monitors connect with your phone via an app, but some simply have a corresponding monitor that can easily be moved from room to room. Smart Rocking: There are several different smart bassinets on the market that vary in capabilities. At a minimum, they can all rock at various speeds that can be controlled by your smart device. Many can also emit white noise to soothe your infant, and/or have built-in swaddling that imitates the womb. Smart Health Monitors: There are many different monitors out there for infants that monitor their breathing, heartbeat, movement, and even sometimes their temperature. Many are wearable, others are worked into smart crib pads and blankets. Not only do these monitors help prevent SIDS, but many keep track of diaper changes, sleep habits and more, then send that data to an app on your smart device. Smart Changing Tables: Whether it is a smart bed stand that acts as a baby station, and smart hub, or a changing mat that measures your baby’s weight to make sure they are properly fed, these products are changing the nursery game. Smart Mobiles: A smart mobile can sense what sleeping stage your baby is at and react to it with sound, movement, and light that soothes your infant. There are several devices along the same line that use light, color, and sound to soothe your child to sleep. Sensors: Many parents use sensors around their children’s nursery or bedroom for extra piece of mind. When the sensors are triggered they send alerts to your smart device. They can be placed not only at external entry points but internal so that you are alerted when anyone is entering or even moving around the room. Climate sensors are another smart choice, making sure your nursery is always the perfect temperature for your baby. Watch over your pets, big and small. Taking care of your fur-babies is easier than ever with smart pet-tech. The best part about these gadgets is that they make life easier for you and your pets. Feel less guilty about leaving them home alone during the day, and enjoy the time you do spend with them that much more. Video Monitoring: Use video monitors to check on your pets when you aren’t home. Special pet oriented pet monitors do more than just let you watch your pets. Many go both ways so that your pet can see and hear you as well, and some even allow you to dispense treats. Self –Cleaning Litter Boxes: Cat care becomes that much easier with self-cleaning litter boxes that wash, sanitize, dry and fill themselves. They even have liter boxes disguised as cabinets, to be truly out of sight and out of mind. 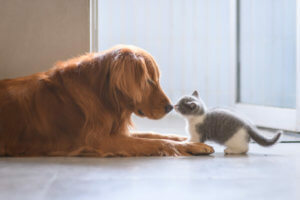 Smart Mats: Many pet owners have nice furniture they don’t necessarily want their pets furring up. Smart mats use various techniques to give your pets harmless warnings to stay out of off-limits rooms and off of furniture. These are especially helpful for training new pets or retraining older stubborn ones. Smart Pet Doors: Smart pet doors work with a smart key that goes on your pet’s collar. They only let animals with the key in and out of the door, so that no unwanted creatures end up in your home. You can also lock the door when you don’t want your pet going out. Smart Feeders: Smart feeders automatically dispense food, and water, for your pets. Using an app on your phone, you can schedule feedings and control portion size for your fur babies. Smart Fans: Smart fans, like thermostats, can be controlled from an app on your phone, set to a schedule, or can be set to sense when they are needed. Smart Floors: Heated floors seem like the height of luxury, but temperature controlled floors that can be automated from your smart devices take the cake. There are not a lot of products for automated heated floors yet, but many smart thermostats can be programmed to control floors as well. Smart Shades: Smart shades can be raised, and closed from your phone or other devices as you like. Many can also be set to a schedule so that they can greet you with sunlight at the same time each morning. Automated Sprinklers: Having a beautiful lawn is much easier with app-controlled automated sprinkler systems. Schedule when your sprinklers go off, which sprinklers are in use, and keep an eye on maintenance needs. Smart Pool: If you have a pool, you know how much upkeep they require. Smart pool apps measure the chemicals in your pool remotely, allow you to automate certain cleaning procedures, and schedule pool repair. Smart Beds: Control the position, softness, and even the warmth of your bed with a smart mattress. Have a snoring partner? Elevate their side of the bed from your phone and problem solved. Some mattresses have added perks, like massage settings, built-in alarm clocks, and built-in sleep monitoring that sends you information about your sleeping habits to help you get the best sleep possible. Hubs can control all your different Smart home devices. With more and more people taking on DIY Smart Home projects, new and improved hubs are hitting the market. Many hubs work by hosting all your app-based devices and then presenting them to you in their own app. These hubs are small, no frills, and fairly affordable. If you are looking for a more visually appealing option, ‘panel hubs’ have a very slick look. They are more common with central control Home Automation systems, but there are some available for app-based devices. The most popular and highly recommended hubs are smart speakers. The majority of Smart Home devices are smart speaker compatible, and those that aren’t are working to change that. Not only is it more convenient to just tell your speaker to turn on the lights, but it really makes your house feel that much smarter. It is like having a digital butler. Watch over your home with smart home security. Whether you are looking to protect your home, business, camp or vacation homes, Home Automation for security is a great idea. In the U.S. a burglary takes place every 15 seconds, with an average of $2,23o worth of damage. Having a Security system lowers the chances of burglary on your property significantly, but only 17% of homes have one. It is predicted that this year, one in 36 properties will be broken into. These security measures can prevent your property from being another statistic. Video Surveillance: Keep tabs on your property from your smart device 24/7, with video surveillance. Worried about false alarms? 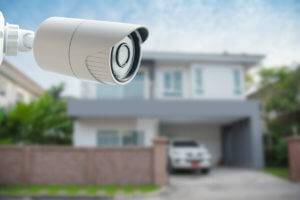 An app-based security system will allow you to confirm an alert yourself, by accessing footage on your smart device, from any camera on the premise. Sensors: Sensors are most commonly used on doors and windows that can be potential entry points into your home. App-based sensors can send an alert to your smart device that someone has used one of your entry points. Automated Locks: Did you know that the majority of burglars come in through an unlocked door or window? Use automated locks to lock your doors from your smart device wherever you are, or just double check to make sure you already have. Alarm System: If the worst happens, and your home or business is broken into, a blaring alarm can be set to go off. Most systems can be set to automatically alert the authorities as well. Fire, CO, and Flooding Sensors: Burglary is not the only threat to your home or business. Fire, gas, and water can also do serious damage. Smart fire/CO detectors offer in-app silencing and send notifications to your phone if they are triggered. They are also a little nicer to look at than your average detector. Flood Sensors work similarly to their detector counterparts but obviously sit lower to the ground. According to the National Alliance for Caregiving, 9.3 million Americans find themselves taking care of aging parents. In-home care can be very expensive, and senior living facilities can take away from your loved one’s independence. Medical Alert Button: Most of us have seen the “I’ve fallen and I can’t get up” commercial. Medical Alert buttons are lightweight, waterproof buttons that your loved one can wear around their neck, on their wrist, or even just carry with them. The button connects to an intercom system, that when activated by a push, calls a medical monitoring center. If needed, someone from the call center can alert you, or emergency services for the patient. Some buttons can even sense when the wearer has fallen and will alert the call center automatically. Video Surveillance: Video surveillance allows you to check in on your loved one from the convenience of your smart device. With video surveillance you can gain peace of mind, knowing that your loved one is safe at home. Activity Tracking: There are several different ways to monitor the activity of your loved one. Medication dispensers can alert you when your loved one has or has not taken their daily doses. Connect to the refrigerator via sensors that can alert you how much or how little your loved one is eating or staying hydrated. You can also monitor other household appliances, to make sure the stove isn’t left on, or the faucet isn’t left running. Security for Alzheimer’s and Dementia Patients: The majority of Alzheimer and Dementia patients wander away from their homes, or living facilities. When this happens, it is a terrifying experience for them and for you. Home security systems can help to make sure this doesn’t happen, by notifying you on your smartphone when someone leaves or enters the house. No technology is a 100% foolproof, and Home-Automation is no different. Here are some things to keep in mind when investing in Home Automation. Unless turned off, smart speakers are always listening. 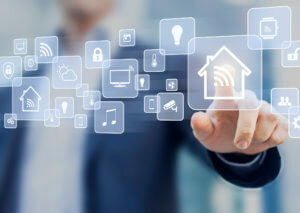 Privacy: When it comes to Smart Homes, you really have to consider the fact that being so connected gives companies the chance to collect data about you. The number one culprit is going to be your smart speaker. Many people leave their smart speakers on all the time, which means they are listening all the time. They learn from everything that you say to them, partially to better serve your needs, but also to sell you more products. For example, if you ask Alexa how to fix a washing machine, don’t be surprised if next time you surf the web you see a bunch of washer ads. At the same time, this type of intrusion isn’t unique to smart speakers, or even to AI assistants like Alexa or Siri. It happens when you like something on Facebook, search for something on google, and use your debit or credit card to shop. Being connected the way we are these days makes everything more convenient not just for us, but for the companies trying to sell to us. As long as you are ok with that, you can enjoy the perks of a smart home. Cybersecurity: Cybersecurity is a very important issue that many people do not take seriously enough. The Internet of Things (IoT) device market just keeps growing and developing, and as it does security for these devices sometimes falls through the cracks. As a consumer, you need to know how to protect yourself, in case developers cannot. The first step to doing so is being informed. Read up on your devices before you purchase them. Know the security threats you might face, and what responsibilities the developer has when it comes to protecting your interests. Network security is another vital part of keeping your Smart Home cyber safe. Start with password encryption, the most important part of network security. You should use strong passwords, and change them often. The same password recommendation stands for any touchpad alarm systems. When it comes to choosing a password, the most random one is the safest one. Even if it seems unique to you, if your password is based off any personal information, it is likely a dedicated thief could figure it out. The next step is making sure your computers, tablets, and phones are all protected with Firewalls, anti-virus software, and that you’re always updating your operating systems. Lastly, it is important that the device distributors can contact you if there are any issues with their products. This is a non-issue if you buy straight from the distributor (e.g. Nest, Phillips etc. ), but if you go through a third party (eg. Target, BestBuy etc.) you should go online and register your devices. The reason it is important to make yourself available to these companies is so that they can contact you if they ever have a security breach, make a recall, or change something vital about their product. Power Outages: Whether a power outage affects your Home Automation systems really depends on the system. Any system that runs through the Internet will be down when the power is out. Home security and medical alert systems that have back up batteries for power outages, and run through phone lines will be fine, but if the phone lines are out as well those systems will also be down. Any system that runs through cellular radio should be safe through either situation, as long as it has ample backup power stored up. Unresponsive Victims: One concern that is often posed is what would happen if the wearer of a Medical Alert button was unresponsive, and/or unable to communicate in a medical emergency. Most Medical Alert Button providers will set up emergency plans with you or your loved one for these situations, but if they don’t it is always a good idea to bring it up before purchasing a service. Now that you have all the information you need on Home Automation, and Smart Home technology, the next step is finding the best products for you. If you think you are ready to take a look at some Smart Home products, OTELCO has a lot to offer in the way of affordable and reliable Home Automation.